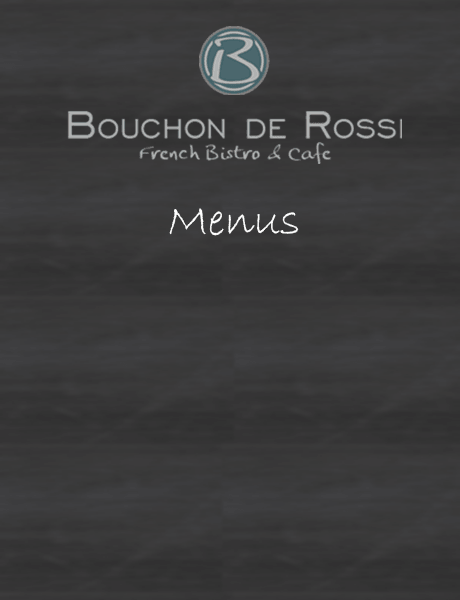 Bouchon De Rossi by day or by night - see our lunch and evening menus bellow. Bouchon offers a lunchtime menu with daily specials, which is tremendous value, together with our extensive a la carte menu. Please ensure you make your allergy clear when making your pre order. Please contact us if you need to discuss options. On arrival at the restaurant please make yourself known to a member of staff, so we know who you are and can double check your meal and Allergies or intolerances. For further information about our christmas menu and availability, please click here. Our specials menu changes on a regular basis, please regularly check back for the latest specials. Bouchon de Rossi LTD is a limited company #06273603 in England & Wales. Registered Office: 217 Oxford Street, Swansea, West Glamorgan, SA1 3BG.